Leighton Baines believes Roy Hodgson's relaxed managerial approach will bring the best out of England. Everton defender Baines thinks there is less tension around the squad, compared to the "stiffer" regime of previous coach Fabio Capello. The left-back, 27, is set for his first start in a competitive international because of Ashley Cole's ankle problem. "He's definitely relaxed us all and there's been a shift in people's mentality," he told BBC Radio 5 live. March 2010 - England 3 Egypt 1 (friendly - played 90 minutes). May 2010 - England 3 Mexico 1 (friendly - played 90 minutes). February 2011 - Denmark 1 England 2 (friendly - came on for 10 minutes). March 2011 - England 1 Ghana 1 (friendly - played 90 minutes). June 2011 - England 2 Switzerland 2 (friendly - came on for 60 minutes). November 2011 - England 1 Sweden 0 (friendly - played 90 minutes). February 2012 - England 2 Netherlands 3 (friendly - played 90 minutes). 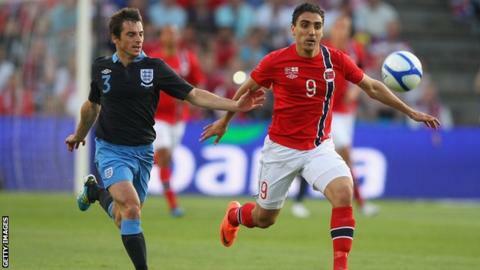 May 2012 - Norway 0 England 1 (friendly - played 90 minutes). August 2012 - England 2 Italy 1 (friendly - played 78 minutes). "When you're around the place you are definitely more relaxed and enjoy each other's company a bit more. "It was maybe a bit stiffer before that, for whatever reason. Roy's definitely come in and had a positive influence in that manner." Baines also says he thinks it is easier for Hodgson to communicate his ideas than it was for his Italian predecessor, something that is an important factor in the new set-up's positive atmosphere. Baines added: "The main one is that he's an English manager and it's a lot easier for him to get his points across to the players and deliver the messages that he wants. "Now he's had some more time with the squad as well, it's given us more of a chance to implement those ideas on the training pitch and hopefully we'll see that out on the pitch in games as well." Defender Gary Cahill, who missed Euro 2012 after sustaining a double fracture to his jaw, could also be set to feature. The Chelsea man believes that missing the tournament, in which England went out in the quarter-finals, has left him with plenty of work to do to force his way into Hodgson's plans, with John Terry, Phil Jagielka and Joleon Lescott also in contention. He said: "I think me not making the Euros has made this harder in one way. I thought the lads did really well at the Euros so for me not being able to stamp my authority in that tournament has come back and made it another fight for me to try to get back involved and get the starting place. "There's great competition and 'Jags' [Jagielka] scored against Italy, Joleon had a great Euros and 'JT' is obviously well known and proven for many years."